I don't know how often people really want to read about this pregnancy, so I'm sort of sticking to the same schedule I did with Henry. Do people like weekly updates? Anyway! 16 weeks! Woah. That's only 4 weeks from being half done. How did that happen? I'm finally feeling way better than I was in my last pregnancy update. The nausea is gone, although I've still had some random gagging related throwing up. The big news over the past four weeks has been that I've started to feel the baby -- who we now refer to as Wiggles -- moving. It happened shortly after I last updated for the first time at 12 weeks 3 days. It was that distinctive fluttering that is unmistakably baby. My OB wasn't surprised that I was feeling movement, especially since I felt it pretty early (but not this early) with Henry. Now, the movements are no longer flutters, but actual baby kicks. Morgan and I have both had the pleasure of feeling the baby move from the outside, even. If this keeps up, I'm scared about how powerful the kicks are going to get. I've officially taken to calling Wiggles a boy. I just have a strong feeling that the baby is a he. Also, we are pretty much 100 percent set on names, but Morgan is unwilling to share at this point -- so blame him. Emotionally, I still feel a void. We've done nothing to prepare for this baby, because I still sort of feel like we are waiting for the other shoe to drop. I feel bad saying this but I'm not really excited. I'm happy, but not joyful the way I was with Henry. I don't know if that's a second baby thing, or a pregnant after loss thing, but I do feel really guilty about that. I have another OB appointment in a little over a week, so hopefully the heartbeat will be strong and everything will look good. Edit for the baby book: Heartbeat was 155 at 17w3d. Everything was perfect at OB appointment. And for comparison, my 16 week update with Henry. Love updates especially since we're not too far from one another in this journey :) you really must havea strong kicker! I'm almost 20 weeks and I've been feeling movements for a long time, but none strong enough for Andrew to feel yet. Can't wait for that :) You look lovely! And for what it's worth, with my second and now, with my third pregnancy, I've been entirely happy about everything, but my joy has not had the same spark as it did with my first. I think there's just something magical about experiencing everything for the first time. I feel a bit of the guilt, too, but I think it's pretty natural. I'm jealous you can feel movements- I'm a week behind you with LO #2 and I haven't felt much of anything yet! 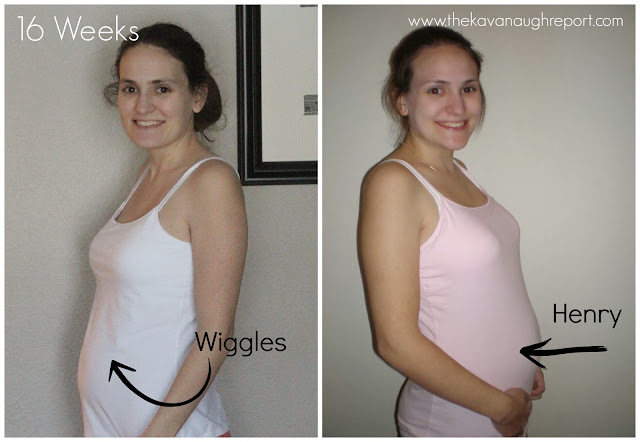 I didn't feel connected to my pregnancy with Logan at all. I just went through the motions and tried to calm down, but I was pretty freaked about something going wrong.